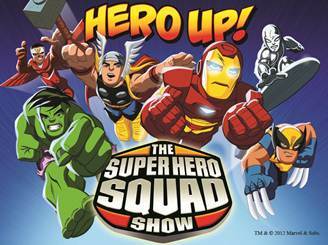 LOS ANGELES – The Hub Television network, a destination for kids and their families, has acquired the hit animated series “The Super Hero Squad Show” from Marvel Animation. The popular half-hour series, which features the world’s best-known Super Heroes including Iron Man, Wolverine, Hulk, Thor, and Captain America will join The Hub’s Monday through Friday lineup beginning Monday, January 30, at 4 p.m. ET (with encore presentations on the weekend). “The Super Hero Squad Show” entertains young fans and their families with a unique mix of action, adventure, humor and satirical storytelling as Marvel’s greatest super heroes unite to protect Super Hero City from some of the world’s most infamous super villains. “The Super Hero Squad Show” was produced in 2009 by Film Roman and Marvel Animation. THE HUB is a multi-platform joint venture between Discovery Communications (NASDAQ: DISCA, DISCB, DISCK) and Hasbro, Inc., (NASDAQ: HAS) with a goal of entertaining, enlightening, empowering and educating children and their families. The cable and satellite television network features original programming as well as content from Discovery’s library of award-winning children’s educational programming; from Hasbro’s rich portfolio of entertainment and educational properties built during the past 90 years; and from leading third-party producers worldwide. The Hub lineup includes animated and live-action series, as well as specials, game shows, and family-favorite movies. The network extends its content through a robust and engaging online presence at www.hubworld.com. The Hub rebranded from Discovery Kids on October 10, 2010, and reaches approximately 62 million U.S. households. The Hub logo and name are trademarks of Hub Television Networks, LLC. All rights reserved.